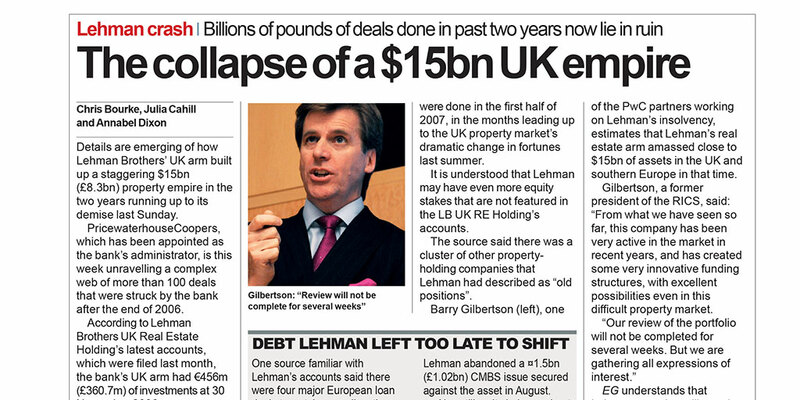 The collapse of Lehman Brothers on 15 September 2008 was the most dramatic economic event of modern times. Its impact on the real estate industry was huge with values plummeting, some of property’s biggest companies falling into administration and moguls losing their fortunes. A decade on and the impacts are still being felt. Some have made their careers and profited massively from the distress that was brought about from Lehman’s collapse and the global economic crisis. Others have never recovered. EG spoke to some of the industry’s biggest characters that were caught in the heart of the storm about their memories of those chaotic times, the lessons they have learnt as a result and whether they think another collapse may be on the horizon. EG spoke to the industry’s leading figures who were at the centre of the collapse of Lehman Brothers in September 2008 about their vivid recollections of the harrowing era and the lessons that have been learnt since. UK commercial property market: is a crash or correction on the way? LSH chief executive Ezra Nahome asks, with prime yields returning to historic lows and Brexit uncertainty, is history about to repeat itself? EG editor Damian Wild thinks it may be that we look back on three deals around this 10th anniversary as a critical juncture. And hopefully a positive one. 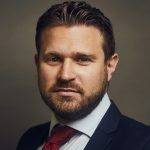 Duncan Owen, global head of real estate at Schroders and former chief executive of Invista Real Estate, talks about the warnings that were ignored. Brendan Flood, the former chief executive of Modus Ventures – the retail developer that collapsed into administration in May 2009 – remembers the “utter shock” he felt as news broke of Lehman’s collapse. Johnny Sandelson – partner at Westbourne Capital Partners, co-founder of Auriens and founder of GuestInvest – talks about how the financial crash destroyed his business. Aubrey Adams, former Savills chief executive, current chairman of L&Q and member of Tritax Big Box’s board, recalls the conditions leading up to the crash, and speculates on a future downturn. Richard Dakin, managing director, CBRE Capital Advisors, remembers the fallout from the crisis and how London managed to recover. As the industry’s most influential players look back at the collapse of Lehman Brothers, Blackstone's Ken Caplan highlights opportunities for growth. Richard Croft, chief executive of M7 Real Estate, examines how the use of data can be fundamental in avoiding another financial crisis. In the first of a series of recollections from the industry’s most influential players looking back at the collapse of Lehman Brothers, Prestbury Investments chairman Nick Leslau reveals how the crisis shaped him and his business. In part two of EG's series of key industry players’ recollections of the collapse of Lehman Brothers, Pat Gunne, chief executive of Green REIT, discusses the cyclical nature of the market and why he thinks another downturn is likely. In the third part of EG's series talking to key industry players’ about their recollections, James Jakeman, partner at Benson Elliot and former executive director at Lehman Brothers, gives his take on the events leading up to the crash. A real estate and finance veteran recalls the collapse as a surreal collision of experiences. Where were you when Lehman’s collapsed? Peter Bill talks to eight big property players as they recall their reactions. Here is what you need to know about the distressed loan market, which is more active than ever. NEXT WEEK: The collapse of #LehmanBrothers was the most dramatic economic event of modern times and its impact on real estate was huge.